The workshop began with the discussion, “What is healthy soil and why is healthy soil important in green infrastructure?” and a conversation about the proven benefits of compost and compost tea. 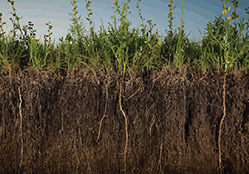 One study used to illustrate this relationship was Faucette et al’s (2005) research, Evaluation of stormwater from compost and conventional erosion control practices in construction activities, which showed that compost initially generated five times less runoff than hydroseeding with a silt fence, and after one year, generated 24 percent less runoff. To further illustrate the importance of healthy soil in green infrastructure and how this in turn supports healthy vegetation and processes such as evapotranspiration, the workshop continued by demonstrating the biological processes in soil. Each life form’s role in the soil ecosystem and in nutrient cycling was explored. These lifeforms included bacteria, fungi, protozoa, and nematodes. 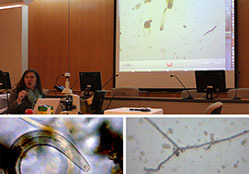 This portion of the workshop also focused on how to identify soil microorganisms with a low-cost microscope and performing qualitative analysis of soil, compost and compost tea. 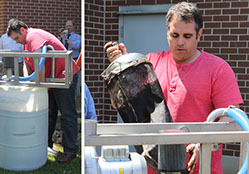 The workshop concluded with a lecture on how to build and tailor healthy compost and compost tea depending on the application (for example, turfgrass vs. woody vegetation application) and then a hands-on demonstration on how to brew compost tea, led by James Sotillo. The compost and compost tea workshop became an important advocacy tool to train contractors to help remediate the Brainerd Rd. site for use as a green infrastructure demonstration project. As a part of Andropogon’s public outreach program to help advocate for green infrastructure strategies throughout the City, this educational video was created to help communicate the benefits of green infrastructure to the public. As a part of a larger effort to expand the use of green infrastructure in the City of Chattanooga, Andropogon led a workshop with James Sotillo of Elmscapes to teach the importance of compost and compost tea in creating healthy soils for stormwater management. 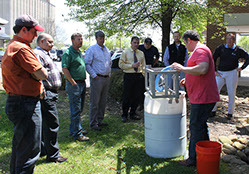 The workshop included a hands-on instruction on how to make tailored compost teas for different applications. The workshop targeted contractors in the region who were interested in green infrastructure projects, but was also open to the general public.